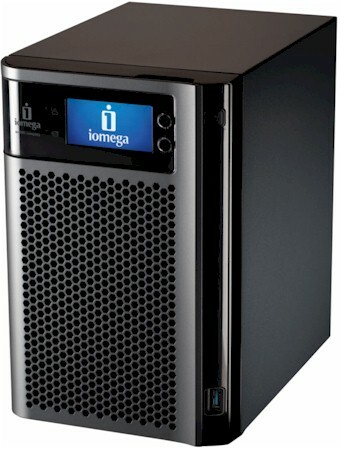 Iomega has been slowly working through a revamp of its entire NAS line, updating processors, expanding features and adding cloud connectivity. The three Intel based newbies announced in May have started to ship and so it is that the six-bay StorCenter px6-300d has made its way onto the SmallNetBuilder test bench. As its name implies, the px6-300d is a six bay NAS. This makes it the next-to-most capacious box in Iomega's current line, with the twelve bay rackmount ix12-300r at the top. The six hot-swappable drives mount in unlockable trays behind a similarly unlockable plastic front cover (Figure 1). Although Iomega doesn't spec support for 2.5" drives, there are mounting holes for them, or more specifically, Iomega's optional 2.5" SSDs (Micro RealSSD C400's). The px6 and its four-bay desktop px4-300d and four-bay rackmount px4-300r siblings are the first Iomega NASes that can be ordered without drives. This is good news for folks who like to select their own drives or don't like sending drives back with sick NASes. So far, however, the pickin's are kind of slim for Iomega approved drives, with only two drives each approved from Hitachi, Seagate and WD and only one 3TB drive (Hitachi Deskstar 7K3000 HDS723030ALA640) on the list. The 12 TB configuration Iomega sent for review (model 35096) was populated with six Hitachi Deskstar 7K3000 2TB (HDS723020BLA642) drives. The rear panel view in Figure 2 is uncrowded with only DC power, two USB 2.0 and two Gigabit Ethernet ports. The px6-300d doesn't have eSATA ports, but there is one USB 3.0 port on the front. Although the removable card slot panel up near the top looks intriguing, there is nothing but empty space behind it. The removable card slot has a PCIe x4 connector on the main board to support it. But Iomega hasn't announced any options to insert into it. If I'm to believe the board markings, the Intel D525 Atom is under the fanned heatsink and its companion device is under the other heatsink. I didn't remove the heatsink and Iomega didn't have SSH or telnet enabled, so I don't know what the other device is. All the other devices were easily identified starting with a socketed 2 GB SoDIMM. I asked Iomega whether more RAM could be added to the second, empty socket without voiding warranty. The exact response was "we don't formally support this currently, but the hardware is capable". Other key devices are two Realtek RTL8111e PCIe Gigabit Ethernet controllers, 1 MB of Samsung K9K8G08U0B flash, a Fresco Logic FL1000G providing the single USB 3.0 port and Fintek F71808E handling miscellaneous I/O. As noted above, the review unit came with six Hitachi Deskstar 7K3000 2TB (HDS723020BLA642) drives installed, which brought the total power consumption to 56 W. Programmable idle drive spindown knocked that down to only 24 W.
It's hard for a six bay NAS to be silent, and the px6 is no exception. Fan noise was low, but I could clearly hear the drives spinning away in my quiet home office. So I'd rate noise as medium low.